This week on Namaste Yoga and in my yoga classes we are exploring hanumasana, better known as the word that puts fear in people, the splits. The pose is named after the Hindu demi-God Hanumasana who soared through the air in the splits in an act of devotion and courgageous recovery, but I get ahead of myself. Let’s begin at the very beginning. Hanuman was born to the beautiful Anjana. Anjana, more than anything wanted to be a mother. Everyday she prayed to the Gods, sitting in meditation with her hands held in the anjali mudra, that she might become a mother. Vayu, the God of wind admired Anjana and her prayerful dedication and decided to help her out. With a gust of wind Vayu placed a grain of rice in her hands. Anjana knew better than to question what she received and took the grain of rice, put it in her mouth and swallowed it into her tummy. Hence, she became pregnant with Hanuman. Hanuman was a very mischievous and curious little baby. When he was born, he was so hungry that his mother couldn’t satisfy him. One morning he was lying in his crib and he looked up in the sky to see a golden ball of light. Hanuman mistook the sun for his favourite fruit, a mango. Being a demi-God Hanuman had all sorts of powers among them an ability to fly (said to come from his father, Vayu, the God of wind), shape shift, and change size. Hanuman decided that he wanted to eat that most delicious looking mango more than anything in the world. So he lept out of his crib and flew up in the sky towards the sun. The sun was rather alarmed to see this young child hurling towards him. In an act of defense, the sun threw a lightening bolt at Hanuaman killing him instantly. When Vayu saw his son plunge to his death, lying lifeless on the ground, he gasped in despair, sucking up all the air in the world. Now not only was Hanuman dead, but nobody else would be able to live either without air to breathe. All the God’s got together to decide what to do. Vayu plead for his son’s life. All the other God’s said that they could not have this little trouble maker running around creating difficulties for everybody else. In the end they decided that Hanuman would live. Hanuman could keep his powers, but the God’s cursed him with anmnesia of them. And just like that Hanuman forgot about all his power. To give Hanuman a new start, he was turned into a monkey and sent into the forest to live with all the monkeys and other animals. One day in the forest Hanuman met Ram. Ram was the seventh incarnation of Vishnu, part of the trinity of Gods Brhama being the creator, Vishnu the preserver and Shiva the destroyer. So Ram is the God of maintenance and protection. Hanuman had an instant connection with Ram and became a devotee. Because of his adoration and allegience to Ram, Hanuman is a symbol of devotion. Hanuman became a faithful devotee to Ram offering him his undending selfless service. Ram had a beautiful wife named Sita. Ram’s enemey in war, the evil demon Ravana became jealous of Sita and kidnapped her for himself. Ravana took Siat to his remote island kingdom of Lanka. Ram, who was busy leading his troops in battle was unable to go and rescue Sita and so he sent Hanuman. To Hanuman this was the most impossible task. He had no idea how he was going to help his dear friend Ram and bring his wife back. Hanuman was filled with feear and doubt. As you remember Hanuman had no memory of his super powers and so he knelt down by the waters edge and prayed for assistance and guidance. Through his faith and devotion to Ram Hanuman gathered up the courage and strength and lept into the sky – flying in the splits across to the island of Lanka. 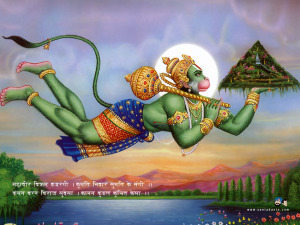 Hanuman was able to shed his fears and fly into a state of fearlessness. Once on the island of Lanka, Hanuman used his powers of shape shifting to become a cat and gather information on the whereabouts of Lanka. Through his powers Hanuman was able to destroy many forces of evil on the island of Lanka and save Sita, Ram’s wife. During one battle, Ram was seriously injured. The doctor who was brought to Ram’s aid said that only one herb found in the himalayan mountains could save Ram’s life. Hanuman of course offered to retrieve the herb from the Himalayan mountains in order to save his beloved Ram. So off Hanuman flew to the Himalayan mountains. Once there he could not be certain which herb to bring back to save Ram’s life and so he brought the entire mountain back to the Ram, just to be sure. Hanuman teaches us that we can move mountains if only we have faith and hope in our True Selves. Hanuman is a symbol of physical strength, courage, curiosity, perseverance, and devotion. Hanuman reminds us of the unlimited powers that lie forgotten in each one of us. Through courage and faith we can become aware of our divinity. Where in your body do you connect with and feel physical strength? If strength isn’t happening, notice that too. How does your strength translate to your day to day life? How does that strength show up or not show up? In what ways do you practice devotion in your life? How does perseverence show up or not show up in your yoga practice? In what ways have you exercised perseverence in your life? Describe a perhaps forgotten part of you that is capable of accomplishing the impossible. How does curiosity present itself in your yoga practice? In your life? In what ways do your fears and doubts contribute to and/or distract from your self awareness? Hanuman overcomes his fears through prayer in the Ramayana (the Indian epic guide to God realization). What do you do in the face of fear? If you were a demi-God like Hanuman, what would be your “super power”? How does that characteristic already show up in your day to day life? What aspect of your yoga practice requires courage? How do you bring that courage from your yoga mat out into your life? May you never forget the infinite power of your divinity. May you be filled with faith and hope so that you can move forward with courage.